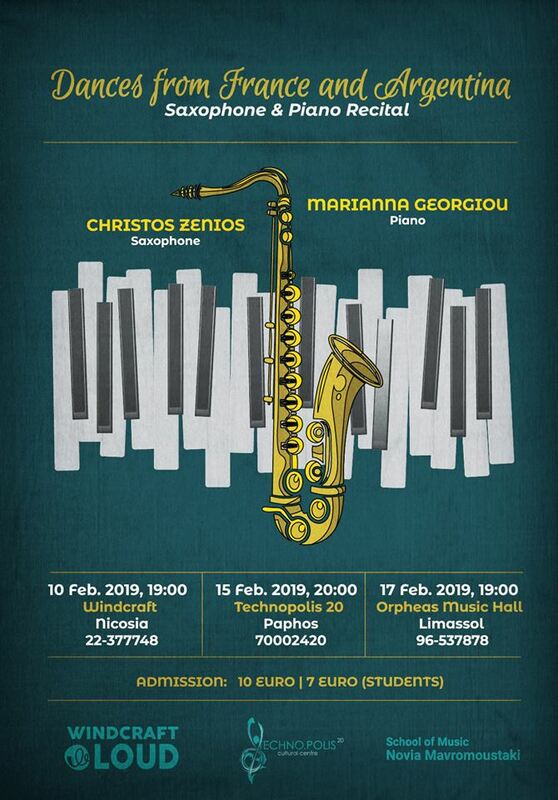 The duet Christos Zenios (saxophone) and Marianna Georgiou (piano), present their third concert for piano and saxophone at Technopolis 20, on Friday, 15th of February 2019, at 8pm. Marianna Georgiou was born in 1993 in Paphos, Cyprus. She took her first piano lessons at the age of five and was classically trained for twelve years under the supervision of the Bulgarian tutor, Ivelina Ruseva. She attained her first Soloist Piano Diploma (ATCL) at the age of seventeen. She also took classical guitar lessons and passed her Grade 8 classical singing exams (ABRSM) with distinction. In 2011, she began her academic career at the University of Nottingham under the supervision of Brenda May and achieved a scholarship and a First-Class Honours for the Bachelor’s degree based on Piano Performance. In 2015, she attained her Master’s degree in Piano Performance and Performance Practices from the University of Nottingham. During her studies, she was part of various orchestral ensembles (The University of Nottingham Symphony Orchestra, the chamber music ensemble, accompanist of vocal groups and the 20th century ensemble). She has taken part in several masterclasses and concerts around UK and Cyprus (Masterclass – Janina Fiaklowska/Clare Hammond, Derby Arts festival -awarded the second prize-, Pre-Concert artist at the Royal Albert Hall of Nottingham for Czech Philarmonic). In her most recent years, Marianna has performed as a soloist and as part of ensembles in concerts and festivals around Cyprus and from September 2016, has taught piano at the Music Schools of Paphos.